Black kitchen cabinets are the right choice for many homeowners looking to achieve a classic, modern and high-impact look in a kitchen. Black cabinets bring drama to the kitchen, but without the drama. Both black and white kitchens are never going out of style. However, this year is heavier on the black. Designers talk about the black color in the kitchen as of a “new neutral”. They say that it’s a sophisticated and bold, but also a badass choice. “Kitchen noir” is obviously a new favorite style in the town. Even though the trends change, one never does. Kitchen is the single most important room in any house. “The ‘super kitchen’ has literally become a living room, family room and office, with finishes, layouts and decor that challenge us to define where the kitchen ends and the rest of the home begins.”, says Nino Sitchinava, principal economist at Houzz. With this important fact in mind, home designers create some amazing kitchen spaces using black cabinets, contrasts, and warm lights. The Works transformed a library into an amazing home. Custom woodworking and black storage cabinets with doors transformed this room into a bold, elegant, and warm living space. High black kitchen cabinets demand a rolling ladder for an access. The black cabinets and island are topped with white Carrara marble like countertops. These countertops open up the kitchen. Black light fixtures define the dining space and add a gorgeous, warm glow to the wood table top. The designers opted for dark stained wood floors to enrich this eclectic mix. Dirk Denison Architects used black kitchen cabinets to highlight kitchen’s interesting architectural details, finishes and fixtures. Black wood storage cabinets stand out against a light backdrop in this New York open concept kitchen. At the same time, contrasting white cabinets and countertops recede into the background. Brown backsplash and an exposed brick wall provide for this black cabinet kitchen a smooth transition to its white elements. Daniel Contelmo Architects created this perfectly balanced breakfast nook. The black island contrasts white perimeter cabinets. White Springs granite countertop helps to ease the transition from an all-white kitchen to the black kitchen island with cabinets. Interior decisions by Karla Trincanello from New Jersey created an updated Mediterranean look. 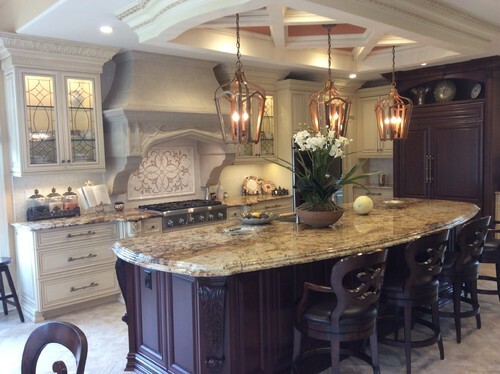 They used light and dark cabinetry, glass leaded cabinets, gorgeous Mediterranean stone stove hood, lantern lighting, and a large dark center island. The kitchen has rustic, country vibe. It is an everlasting classic, perfect for family gatherings. The next kitchen design comes from the same designer. In this modern kitchen, black upper cabinets are incorporated with high gloss contemporary style maple. The designer balanced perfectly black and maple with the high gloss backsplash and stainless appliances. The cooking space flows seamlessly with the rest of the house. The designer examples above are only some we like the most of many styles that can be achieved in kitchens with black cabinets. The U.S. Houzz Kitchen Trends conducted a survey where almost two-thirds of the people spend three or more hours a day in the kitchen. They cook, bake, eat, entertain, socialize, read, watch TV and do work/homework there. Study includes responses from more than 2,400 homeowners who have completed a kitchen renovation project in the past year. This shows that kitchens became real hubs of the house. Their importance will only grow in the years to come. This is why finding the best style and color for a kitchen is not an easy decision for anyone. You would perhaps be surprised, but black wood storage cabinets are very versatile. They can help you create a classic or traditional, fresh and modern kitchen in your home. With black cabinets in your home, you will be encouraged to make bold moves. You will make contrasts and you won’t be afraid to add more black storage furniture to the space. By installing black kitchen cabinets, you will make a powerful statement. This is why you should not be afraid to mix, match and create strong contrasts. Whether you’re looking for intensity or ultimate sleekness to bring to your kitchen, don’t be intimidated by black kitchen cabinets. 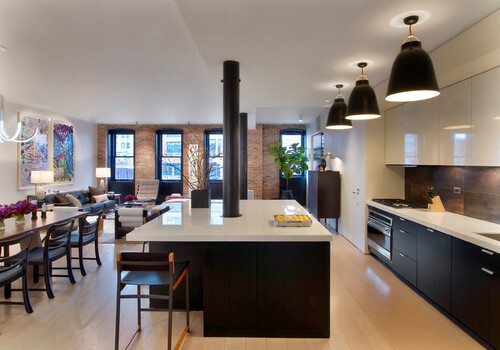 Black color will bring a special dynamic to your cooking space. This is why your kitchen will always look modern, regardless current trends. Nevertheless, before selecting black cabinet kitchen, a few things should be considered. Think about the amount of light available, the role you want your black wood storage cabinets to take in the room, and the preferred style you wish for your cooking space. Since kitchen cabinets in black color absorb light, you should assess the lighting situation. This is the key to determining how many black storage cabinets with doors to include in a kitchen’s design. If the room has a wall of windows or a skylight, the homeowner can opt to install both upper and lower black cabinets. They will not detract from the sense of openness created by the light source. If the kitchen is in a more enclosed area with smaller windows, it may be advisable to keep the black cabinets below the level of the countertops. Use more reflective lighter colors higher up in the room. The white upper cabinets are a classic, yet perfect solution. Simply go with open upper shelves instead of closed cabinets. The shelves will ensure your kitchen feels open and airy, too. Glass front kitchen cabinets are another option to open up your kitchen space and introduce contrast. They are also an excellent solution for your kitchen with black cabinets. You’ll provide some space for all those pretty possessions to display. There is also a case when black wood storage cabinets won’t absorb too much light. The semi-gloss kitchen cabinets will reflect enough light around the kitchen. 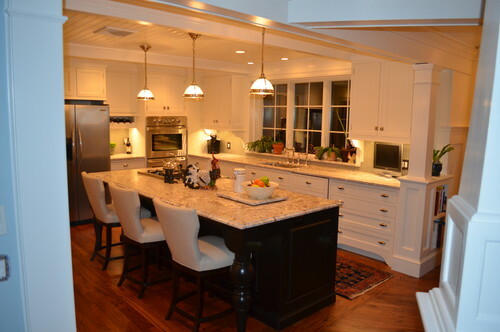 Granite or quartz countertops in lighter colors will help the situation and keep the kitchen feel light and bright. You can also bring in other light-reflecting materials. Stainless steel appliances, interested hardware for your black kitchen – pulls and knobs of the right choice can only help. Another important decision is whether black storage furniture should be a focal point or should instead make a more understated contribution to the room’s design plan. If your black kitchen cabinets are painted with a charcoal color and have a matte finish, the kitchen’s storage spaces can serve as a minimalist, yet modern backdrop for other colors, textures, and features in the room. Should you wish instead to highlight the black in the space, you can choose a glossy paint in a more saturated tone for your cabinets. One way to create impact is to install a kitchen island with shiny black cabinets below a white or marbled surface. Glossy pendant lights will make this look even more striking. The installation of black cabinets can ensure that cooking can be done in a place that feels modern. It is not the black cabinets in a kitchen alone that dictate the style of one of the most important rooms in a house. Shelving, lighting fixtures, countertops, wall coverings, and flooring are also important. These design elements help determine the overall direction of a room. Black cabinets combined with these other elements can create rooms that have an urban feel, a sleek European look or even a contemporary rustic style. Combine black wood storage cabinets with kitchen cabinets of other darker colors. Hang an elegant pendant lighting over an island or a table. This way you will put a focus on the island surface. You will also bring in other enriching details to your cooking space. The bar stools are the opposite of the room white on black. The room is black on white. A fair split of black and white in this kitchen gives a well-balanced and gorgeous look to this kitchen. Black kitchen cabinets showcase beautiful chandeliers and balance the dark floors in the space. Use interesting pendant lights designs and highlight an architectural detail in the kitchen. A more minimalist European look is possible using black kitchen cabinets. Pair black wood storage cabinets without pulls or knobs with white countertops and white stool chairs. You will get simple, classy, and modern kitchen look. Light wood lower cabinets mixed with black glass-front upper ones, white marble-like countertops and copper light fixtures can create a special atmosphere in your kitchen. This style is rustic and warm, yet still very contemporary. You can combine dark countertops and black storage cabinets with white cabinetry. This will create an ultimate contrast. Black kitchen cabinet combination with white kitchen with subway tile, hand-scraped hardwood flooring, light granite countertops, a farm sink, a professional oven range and a beautiful table in a contrasting color is a dream come true. Kitchen with black cabinets may seem a bit overwhelming. Leaving lower cabinets black and going for the white color on the upper cabinets, changes this impression drastically. If we add to this a checkerboard floor, we get a winning traditional-meets-modern combo. It is possible to create an amazing black cabinet kitchen with some rustic elements into your décor. Warm and grainy wood surfaces give special charm to the rustic design. Incorporate them into your kitchen plan. They can find their place on the floor, on your kitchen’s countertops, or on the ceiling. Nothing stops you to incorporate wood surfaces in all of these places. If you add pulls and knobs of the right color to your black kitchen cabinet, the contrast will be complete. Tall black cabinets with light quartz countertops, walls and floor in gray shades. A simple, crisp, and elegant combination for a timeless kitchen. Contrasting the color of your kitchen island with the rest of your kitchen provides a powerful effect. When the contrast is a dramatic black-and-white combination, you get a powerful focal point in the kitchen. Contrasting an island to the rest of the kitchen is a bold move. A traditional white cabinets kitchen gets an attitude and becomes edgy and sleek. A similar bold and striking effect will provide a white kitchen island contrasted to the kitchen with black cabinets. Black kitchen cabinets don’t have to be paired only with white subway tile for a modern kitchen look. Black cabinets and a glass backsplash provide a modern and updated look. Kitchen is not only the place where people eat. It’s the place where people connect and spend time with each other. It’s the place where families are raised and future grownups are shaped. You’ll want the space where you spend the most of your time to say something about you and your family. With black kitchen cabinets, you will certainly manage to pass a powerful message. At the same time, you will enjoy their elegance. A kitchen with black cabinets will leave just enough space for your original and unique ideas to show. Cabinet Refacing vs New Cabinets – What to Do?